Please don't break that bottle! Tradition asked that ships be christened with a wine, its container smashed against the hull. Pack St. Clair and Steve Sherwin have a better idea. The willingness to confront risk defines entrepreneurs. In their ability to look past short-term difficulties, entrepreneurs discover long-term rewards. In an acceptable level of uncertainty they find something like joy. In their ventures shall you know them. Pack St. Clair is an entrepreneur. Across his 40 years in the boat-building business he has calculated downsides sufficient to drive a man to drink; across his 40 years in the boat-building business he has calculated upsides sufficient to enjoying the superb glass of Pinot Grigio. In fact, pack enjoys wine so much that he sometimes spits it out. His son now understands. "On one day of our early visits to Napa Valley I had been walking around all morning with Dad and Steve Sherwin and some folks, drinking these spectacular wines," Paxson St. Clair remembers. "Or rather, I was drinking these spectacular wines, and the older, wiser members of our little group were tasting these spectacular wines. They'd sniff and swish and swirl and split the wine back into their glasses. By noon I'm interested in a nap, and these guys are going strong." The St. Clairs build boats. 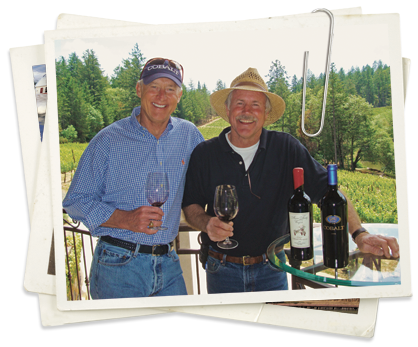 Sherwin family of St. Helena, California, makes wine. This is the story of an entrepreneurial partnership made well above sea level. "I've collected wine for a long time" Pack St. Clair says "and over the years I've begun to think about ways that we might use good wine to enlarge Cobalt Boats' image. A few years ago I came upon with some grapes from Sonoma, a Shiraz, and after I bought the harvest, I naturally went looking for a vintner. I could not have found a better partner than the Sherwins." In the mid-1990s, Steve and Linda Sherwin were looking for some quiet, a place apart where they might raise their children in peace, winemaking not necessarily on their minds at all. A successful developer in the bay area, with projects ranging from high-end residences to schools and apartment complexes, Steve had spent 29 years building his business and, as he recalls, "the work seem to be easing a bit. I had the company under hands-on control. But... I don't know.. about noon every day, I find myself tensed up, my chest tightening." And soon enough weekends found the Sherwin's on the winding narrow roads above Napa Valley, the search ending at last in early 1996 on 30 acres near the top of Spring Mountain at a property showcasing a gorgeous home, a postcard perfect lake and . . . voila! 3 acres of mixed old vines. – Cabernet Sauvignon, Merlot, and Cabernet Franc – originally part of a 500 acre estate producing primo vintages from the late 19th century up through Prohibition 30 years later. The property purchased, his nerved-up construction endeavors now farther back in his mind, Steve began to clear the property essentially by himself – Steve and his D8 CAT, the gnarly old timber no match for the dozers weight and horsepower, in the operators relentless push to build a new life for his family. In time he harvested more than 150,000 board feet of fir, 50 big loads trucked to an Oregon Lumber mill. And the rocks! Boulders big as Volvos embedded in Spring Mountains red volcanic soil. "Every building, every fence up here was built from those rocks," Steve says, neck muscles ratcheting in the memory. An old fishing buddy from down in the valley showed up to help. Ron Bertolucci, scion of farming and viticulture legends, knew the right root stocks, the appropriate clones, the best trellis designs and the proper drip irrigation system. With Bertolucci family knowledge supporting the effort, the winter's tall grass disked down and Steve and Linda, their three kids, and six hired hands set about in the spring of 1997 pounding down nearly 4,000 grape steaks to be followed by the hand planting of an identical number of vines. Thousands of man hours later 11 more acres lay planted with new vines of the original varieties, the large majority of the ground given over to Cabernet, virtually equal plots of 1.5 acres or so to Merlot and Franc, ratios chosen to maintain a field blend identical to the original vineyard's. The floor of Napa Valley bears only broad climactic similarity to its mountainous surroundings. At the Sherwin family Vineyards temperature is on a typical day 10 degrees cooler than down in the valley. At night, the cold creeping into St. Helena from the bay, the temperature mountaintop stands 15 degrees warmer. "Obviously the fruit is key to our operation. Easily 80% of it's success determined by the quality of the grapes, and we have the weather patterns up here to thank," says Steve Sherwin. The Sherwin's farming practices and their processing of the fruit play critical roles as well, trellis system guaranteeing even exposure to sunlight and ensuring the proper positioning of vertical shoots, irrigation systems delivering just the right amounts of water at just the right times, and the hand-work of the picking (only at night, at the coolest possible ambient temperature) and the most important step of the processing, the destemming. The Sherwin family made its name in Cabernet Sauvignon, first from vines inherited in the purchase of the 30 acre estate above St. Helena. While those vines continue as the backbone of the operation, younger vines planted 1998 are now making significant contributions to the color, fruitiness and density of the wine. In 2004 the winemakers, for the first time, cold soak the fruit prior to fermentation, adding to Steve Sherwin's mind "a new layer of depth and complexity to an already lush Cabernet." The critics, it would seem, agree, writing of "flavors rich and pure, built around ripe plum, current and cherry, with a dash of earth, spice and floral character. . . firmly tannic. . . a highly successful mountain grown wine that manages to smooth out the rugged tannins and provide a supple, polished texture." Or, of a later Sherwin vintage: "dark, rich, intense and sturdy, packed with ripe, deeply concentrated blackberry and black cherry fruit, supported by a lively acidity and firm tannins. 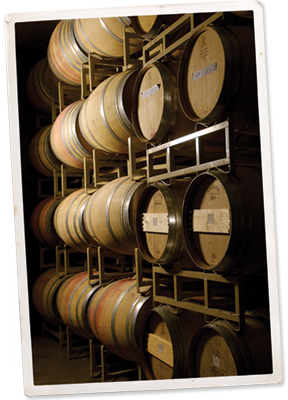 . . built for short-term cellaring." Steve Sherwin has been outdoorsman all his life. Raised on a cattle ranch, with hunting and fishing trips the principal recreational rewards of his hard-working years in construction, he knew Cobalt boats by reputation. When a mutual friend in the marine industry told him about a man named St. Clair was looking for a winemaker, a fine new friendship was in the making. And so the Cobalt vintages follow directly in the tradition of the big Cabernets brought off Spring Mountian, all the care and craftsmanship of the Sherwin's gravity-flow winery transforming Pack's good grapes into "something very special indeed." As with the venerable boat-builder who gave the vintage it's name, as with the construction-toughened vintners who brought it to fruition, this rich red table wine is all entrepreneurial. Hands-on. Full ahead. Risk be damned. Cobalt wine taste something like success. Hard-earned, ongoing, intuitive and ambitious. Ambitious as tomorrow morning with yet more good work to be done. Here's to offering one's friends the very best that a family can do.